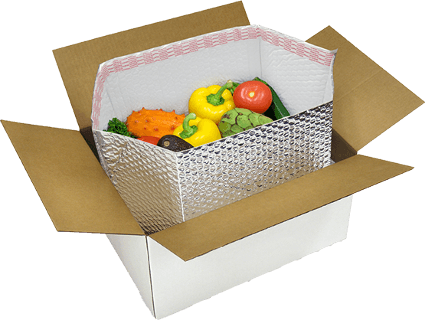 Whether you are shipping perishable pharmaceuticals, chocolates, food or flowers, it is important to remember that temperature sensitive products require careful consideration. Failure to address the unique challenges of temperature controlled transport can lead to spoiled products, loss of revenue and disappointed customers. Identifying the challenges of temperature controlled transport can help you avoid common pitfalls and keep your products moving safely. For many, refrigerated trucks are the answer to safely transporting temperature sensitive foods and pharmaceuticals. Although refrigerated trucks do play an important role in safe transport of many goods, there is danger in relying on a single solution. For many delicate products, even a short time outside the ideal temperature zone can lead to spoilage. A product that is kept at adequate temperature during transport can be quickly compromised if it sits in the sun on a loading dock upon arrival. Shipping temperature sensitive products requires a system that will control temperature throughout the entire packaging and shipping process, not just during transport. For this, manufacturers can utilize specialized cold chain packaging. Cold chain packaging is an ideal choice because it protects the product throughout the chain of transportation. The use of cold gel packs combined with insulated box liners are often adequate for shipping products by standard carrier, eliminating the high cost of refrigerated transport. Unfortunately, not all packaging is created equal. Poorly manufactured or untested products can fail. Another source of failure is human error during packaging. Materials that are time consuming or confusing to use contribute to human error. When choosing a cold chain packaging product, it is important to identify a trusted partner who understands the requirements of temperature sensitive transportation and regularly tests their products to ensure ease-of-use, safety and compliance. Finally, ever-changing regulations directly affect how manufacturers can legally transport temperature sensitive products. Policies that outline adequate transportation methods of temperature sensitive products can be confusing. It is important for manufacturers to stay on top of these issues and be ready to seek out new or better solutions as they become available or required. PAC offers a variety of cold chain packaging solutions and specialists who can consult with you about your unique shipping needs. Connect with a packaging expert today to explore how we can help ensure safe, compliant shipping of your temperature sensitive products.